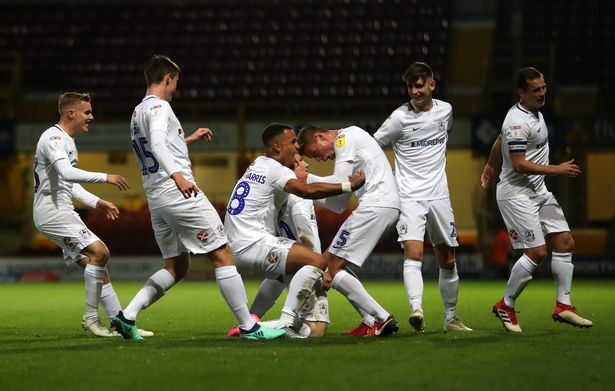 Two goals in the first 11 minutes saw Coventry City blow away their Bradford hoodoo in a pulsating match that extended their winning League One run to four games. Jonson Clarke-Harris lit the Sky Blues touchpaper after just a minute and 20 seconds when he headed home from close range before a superb Conor Chaplin free-kick doubled the lead before the Bantams had barely broken sweat. And despite the home side pulling two goals back in the second half of a six goal thriller, Jordy Hiwula and Tom Bayliss put the result beyond doubt with fine individual goals to cap a brilliant night in West Yorkshire where the home side ended the game with ten men. Coventry had managed just one win in 15 trips to Valley Parade prior to claiming their latest three points, which lifted Mark Robins’s men to eighth in the table. City got their noses in front from the second minute when they enjoyed their first corner of the game, Michael Doyle sending in a superb flag kick that met the head of Tom Davies who sent it goalwards where Jordy Hiwula flicked it on to Clarke-Harris who nodded over the line from close range. Clarke-Harris almost made it 2-0 in the seventh minute when he got his head on the end of a Junior Brown but the big striker was denied by a brilliant save to push it onto the left-hand post. But the visitors doubled their lead shortly after in the 11th minute when Hiwula was fouled just outside the box and Chaplin stepped up to bend a sensational free-kick round the wall and into the top corner, giving goalkeeper Richard O’Donnell no chance this time. Robins’s men spent much of the rest of the opening half containing the home side who attempted a fight-back without really hurting their opponents, bar a couple of long range efforts and handful of set pieces. City appeared content to soak up the pressure and play on the counter attack, Dujon Sterling going close on the half hour mark when he raced forward on the overlap and hit a ferocious angled shot across the face of goal. Coventry started the second half as they had the first, on the front foot as they looked to extend their lead. And they almost succeeded when Clarke-Harris got on the end of a Sterling cross, only to be denied by a good save by the keeper. Anthony O’Connor then pulled one back for the home side to make for a nervous spell but that was short lived as City quickly restored their two goal cushion when a blistering Hiwula counter attack and fine finish saw Coventry lead 3-1 with 65 minutes on the clock. Tom Bayliss then added a fourth on 71 minutes, hitting a low reverse shot from 25 yards to confound the keeper and make the result look beyond doubt. The home side, however, kept on fighting and O’Connor pulled a second back when he hit a loose ball just out the box that flew in off the underside of the crossbar to make it 4-2. There was high drama at the death when Bradford thought they’d scored again as Ryan McGowan bundled the ball over the line from close range. But the referee disallowed the goal and sent the player off for a second yellow card, having already picked one up for diving, to reduce the home side to ten men for the last few minutes of an incredibly exciting game.